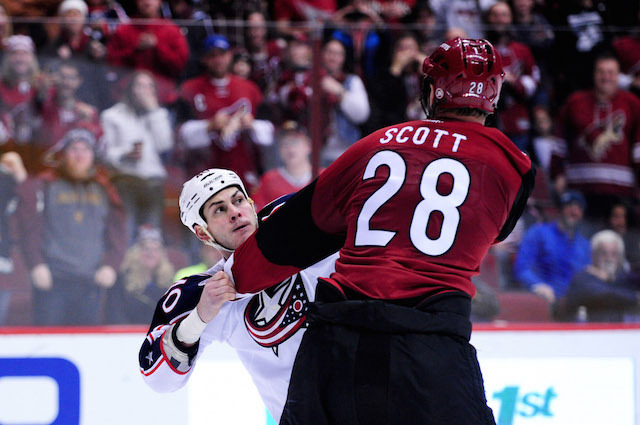 In what has been a bizarre whirlwind of events in the past few weeks ex-NHL enforcer John Scott will be making an appearance as an All-Star captain for the Pacific Division despite being in the AHL, traded to the Atlantic division, and having 11 career NHL points. Why is John Scott an All Star? A one time 3 goal scorer (5 career), lifetime 542 penalty minutes, 11 games played this season, and being sent down to the AHL don’t scream All-Star material. John Scott was voted in as a joke, using the NHL fan vote he garnered more votes than any other NHL player. Oddly enough the NHL blocked this move like a angry child throwing a temper tantrum, even going so far as to force his trade to Montreal. Sure that may be speculation, but come on. It certainly seems like they tried the “he can’t play for the Pacific Division if he’s in the Atlantic!” play. After an outcry from the fans on social media using the hashtag “#FreeJohnScott” the NHL did what was right and will let him play in the All-Star game. But the question remains, SHOULD he be allowed to play or is he making a mockery of the All-Star game? After all, Scott will now have played in as many All-Star games as Sidney Crosby (who didn’t get into this year’s game). The answer is simple, give the fans what they want. The NHL All-Star game, much like many professional All-Star games has become a joke. Games ending 17-13 with zero effort put out and zero defense played, makes for terrible TV. A game which started out as a benefit game for Ace Bailey after he suffered a career ending hit by Boston’s Eddie Shore, turned into an exhibition between the leagues best after a few years. This tradition continued all the way to 1996 in Boston’s Fleet Center where, arguably, the greatest All-Star game was played. This game saw Boston’s own Raymond Bourque scored the game winning goal with 37 seconds remaining in the game to win 5-4. A game that saw toughness, grit, and defense played throughout; something that would be lacking for years to come. We are left now with games high in scoring, yet very dull with zero entertainment and zero watch-ability. So the answer to the question, “will he make a mockery of the All-Star game?” is a simple, no. The All-Star game in itself has done a pretty good job at that. But fret not, for there is still hope. Now we have something the fans cried for, some fun. We will already have the change to a 3-on-3 tournament, but now we will get the added bonus of having an aging enforcer out there who can barely skate to play alongside otherworldly talents like Jagr, Kane, Ovechkin, etc. That should be hilarious! It won’t bring back the feel of players actually trying and playing a good game of hockey, but it will make it worth the watch. It gives fans something to cheer for; will he score a goal, how funny will it look? It’ll be good for a laugh, and will give fans a reason to actually watch the game. Something fans have been doing less of year after year. So although the NHL originally dropped the ball on this potential goldmine we have to applaud their response to let the fans have what they want. After all, this game is for the fans, so let them eat cake!